Pierate - Pie Reviews: The Mother of all pies? So having been informed of Mother Mash's new pies, that were apparently even better than our last visit by Pierateer SJL, it sounded like a great excuse for Pierateers RAS and TJP - along with a faithful pie comrade known only as ACT - to rate their pies! So having made their way to Ganton Street in central London, the lads were ready to taste the new additions to the kitchen. For those unfamiliar with the Mother Mash format, you select your mash, your pie (or sausages) and your gravy, though the Pierateers bucked this trend by naturally starting with their pie choice first. With three new pies on the menu, there will little time spent on the small talk! The friendly staff Iona helped us through the mash and gravy options and the lads eagerly awaited their pie and mash experience. It didn't disappoint! Pierateer RAS went for the Chicken, Leek and Ham pie. Packed full of meaty goodness, the filling oozed out nicely as the cutlery made a very appealing crunch while slicing through the pastry lid. Despite being doused in delicious gravy, the pastry lid was still crisp and had a really nice crunch to it. But it wasn't just the lid that was crisp, for the sides and base of this pie were delicious and crisp too! I was glad this pie didn't fall foul of having a crisp lid but overly thick/solid base and sides, which have downgraded many a pie before! In fact, in terms of condition there was very little I could fault! The colour was also pretty much spot on. Onto the content and the chicken pieces were both large and tender. I couldn't really have wished for better chicken, with the only query I had being the distinct lack of leek and ham in this chicken, leek and ham pie. I only spotted one piece of leek and little ham. Sure, those who know me well won't be surprised I thoroughly enjoyed the heavy bias to chicken (I'd go as far as to say a 90-10 split in favour of chicken) but I’m just saying that I was expecting the mix of flavours in my pie. Capacity was very strong though and thoroughly enjoyable. 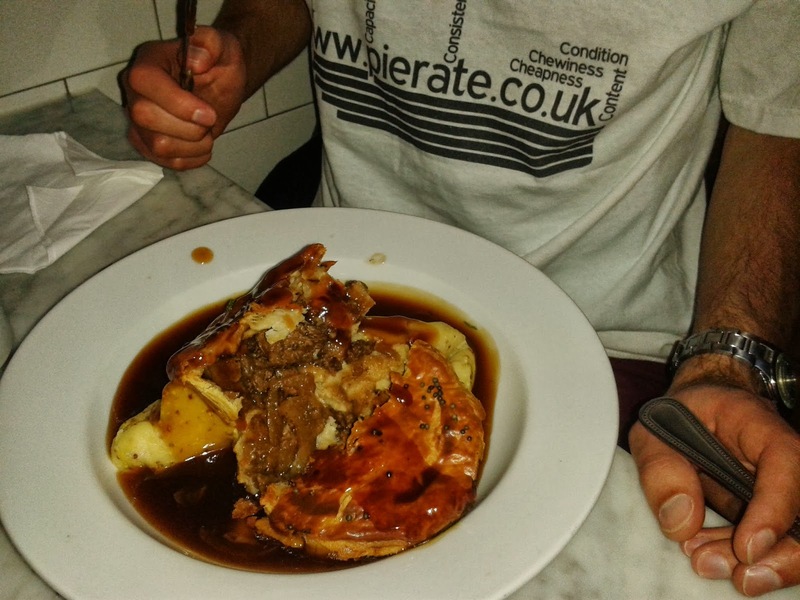 Pierateer TJP - who also incidentally brought his own Pierate mug to the occasion - opted for the steak and ale pie, with a creamy mustard mash and farmers gravy. When the pie arrived, I couldn't help but admire its beauty for a few minutes. The colour was practically faultless, and the condition that the pie arrived in could not be bettered. It charmed us all with its rustic authenticity. 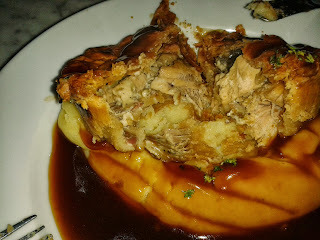 Diving in to the pie with a knife and fork, I could truly recognise the quality of the pastry, the crunchiness of which was impervious to the onslaught of bacon-flavoured gravy. Capacity wise, this pie packed a punch. Perhaps the Mother Mash chefs had been shoving extra steak in to the pie for the Pierateers (hence we all try to keep a very low profile to avoid recognised...apart from the T-shirts of course), but either way it was jam-packed to the rafters with big, quality chunks of steak. My initial reaction on opening the pie was that the content looked a little dry - but then I remembered the enormous pool of gravy around it! It seems that the pie is used as a vehicle on which you can eat the mash and gravy. Had I eaten the pie alone, I perhaps would have complained that it was a little dry and needed more gravy. But as a dish here at Mother Mash, where the pie is complemented by heaps of mash and gravy, the pie is not at all dry. The steak was melt-in-the-mouth and not chewy. 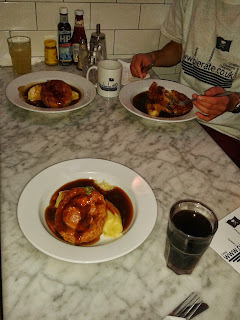 The cheapness of the pie was another 'plus point', although you can get cheaper pie, mash and gravy elsewhere in London. The ale-ness of the pie was lost a bit among the mash and gravy, so I didn't really notice as much richness of the ale as I have in other steak and ale pies. However, this pie was delicious and I wouldn't hesitate in recommending that you try one as soon as you can. At £8.95 this is a very reasonably priced pie for top quality pie and mash in central London. 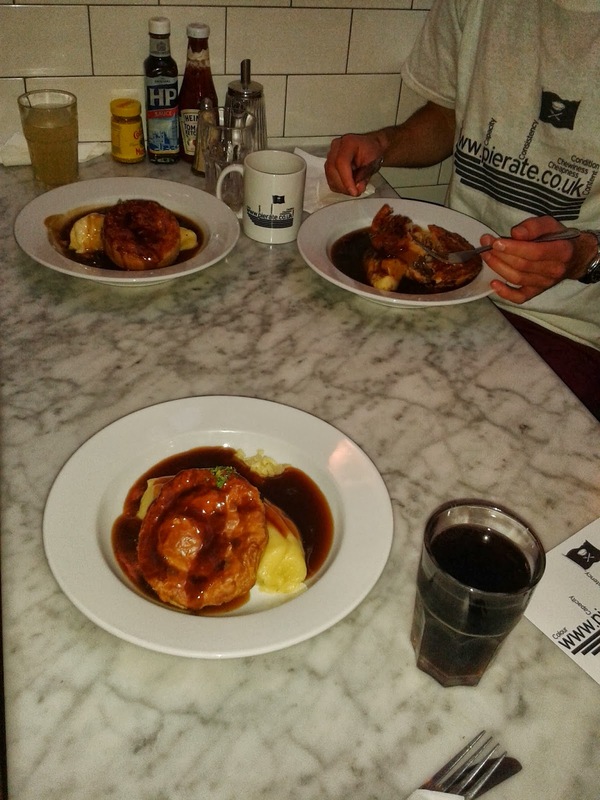 While they specialise in mash (hence the name), we highly commend the pies! They fully deserve their place in the Best Pies in London Restaurants list and here's hoping they open a Birmingham branch in the near future! p.s. We had our just desserts at Mother Mash to! Check out our pie review of the Mother Mash Cherry Pie. I went on Monday just gone and was sorely disappointed. On their web site they waxed lyrical about their potato being perfection because it was freshly cooked. Well they must have found a new way of cooking because within 10 minutes of ordering my food was served. The mash which was Colcannon was the worst mash I think I have ever had it had this sour taste to it but I just couldn't put my finger on it or I would have sent it back. I also had the red wine gravy which confused the issue. Now onto the main event the pie. If there is one thing I hate with a pie is one that has been microwaved. Obviously 10 minutes is not long enough to cook a pie properly and sure enough the pie was soft and soggy. It was the most horrible way to destroy what looked like a quite decent pie. On leaving the restaurant I was extremely disappointed and of the firm view that I would not be returning, a real shame.